Oil Painting Instruction Manuals and Handbooks in Britain 1800 - 1900. With reference to selected eighteenth-century sources. Recipes for varnishes, vehicles, paint mediums and grounds are compared and tabulated as well as methods of painting and the "artistical" properties of pigments, their working qualities, drying times and cautionary notes on their use. 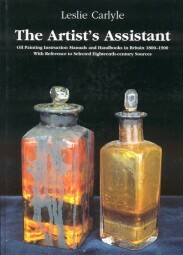 Kundenbewertungen für "Leslie Carlyle: The Artists´ Assistant"